Becaz Akitas proudly introduces our new star ‘ARSON’ Daykeyne Stop Looking Im Here. This young man has it all. A stunning head piece, large bone and substance, angles, sound moving and an attitude that’s all AKITA! Arson finished 2010 as South Australia's No 1 Rising Star Akita and No 1 Rising Star in the Utility Group!!! 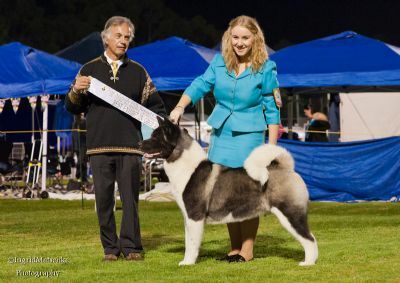 Consistently winning Best of Breed Akita, a multiple Puppy in Show winner the future sure looks bright! 24th and 25th April 2011 Arson wins BEST IN SHOW!!! 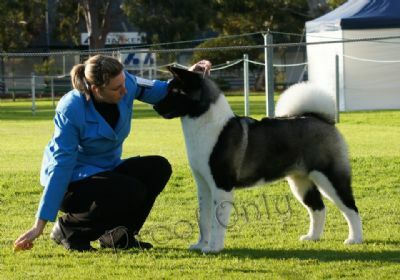 Thank you to Tabatha Buckley from the World Famous Daykeyne Akitas, for sending Arson to come play in South Australia.